New research was presented in October, 2011 in Boston - during Academy 2011 Boston - on the connection between ADHD and convergence insufficiency. Convergence insufficiency is an eye movement disorder where the two eyes do not work together properly when doing near work such as reading. The lead researcher, Eric Borsting, OD, MS, FAAO, FCOVD, is an optometrist who for the last several years has been looking into the connection between common behaviors associated both with attention deficit hyperactive disorder (ADHD) and convergence insufficiency. The research is important because convergence insufficiency is very effectively treated with vision therapy. To the extent that the behavior of an individual thought to have ADHD is attributable to convergence insufficiency, treatment of the latter may be a benefit to the patient in resolving some or all of the patient's academic and/or behavioral issues. The research showed that significant improvements were found in academic behaviors and attention as a result of vision therapy for convergence insufficiency. The study was conducted under the Convergence Insufficiency Treatment Trial, involving 45 children between 9 and 17 years old with symptoms of convergence insufficiency. "All received 16 weeks of therapy, with 8 weeks of maintenance therapy where they're not coming in every week," Dr. Borsting said. "The Conners 3 ADHD Index is a 10-item survey that screens for attention problems in children, including 'inattention' and 'easily distracted,' and the Academic Behavior Survey is a six-item survey of behaviors a parent can observe, such as 'appears inattentive' and 'avoids reading,'" he said. "Here I'm reporting data from the two surveys," Dr. Borsting said. "For both surveys, I found significant improvement in scores." Learn more on the connection between convergence insufficiency and ADHD here. Our previous posts on convergence insufficiency covered the success rate of vision therapy treatment (which has been shown to be the best treatment available), what science has to say to adults with convergence insufficiency,what symptoms may indicate convergence insufficiency as well as commonly prescribed treatments that have been proven ineffective by recent research. A CBS news affiliate in the United States aired this story about vision therapy. The main points are that school eye screenings don't check for many treatable vision problems such as visual perceptual skills or binocular vision dysfunction which make it difficult for a child to learn. Note that people with these problems don't have a "learning disability" as that term has come to be defined to include things like dyslexia. 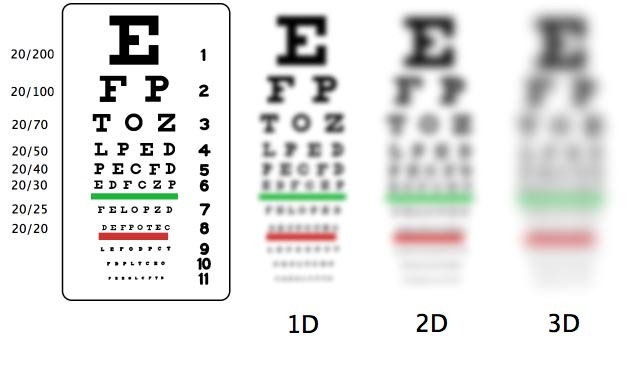 However, vision problems make learning - 80% of which is done through our visual system - much more challenging than it is for classmates who do not have such disorders. The myopia epidemic: why it is so dangerous. Myopia, also called nearsightedess, is increasing in the population at an alarming rate. According to the National Institutes of Health in 1972, the frequency of myopia was 25% in Americans aged 12 to 54. By 2004, it had increased to 41.6%. (Roan,2010). Even worse than the increasing frequency of myopia is that for affected individuals it has a tendency to get worse over time. Some of you may say, "Who cares? People can wear glasses." 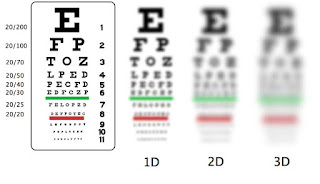 Corrective lenses may fix a myope's blurry vision but myopia is far more dangerous than blurry vision. The danger of myopia is that it can lead to blindness due to the adverse ocular changes associated with it. Myopia causes abnormal stretching or elongation of the eye which can cause thinning and weakening of the retina (the thin membrane at the back of the eye that contains the cells that send visual information to the brain). This elongation may pull on the vitreous (the gel substance that fills the eye) which in turn pulls on the retina. This proces can cause a retinal detatchment - a medical emergency requiring immediate surgical attention. A detached retina can lead to blindness. Another problem with myopia is glaucoma. Moderate to highly myopic people are twice as likely to develop glaucoma. (Mitchell 2000). Threfore, it is important for myopic individuals to see thier optometrist regularly to ensure that glaucoma is not developing.